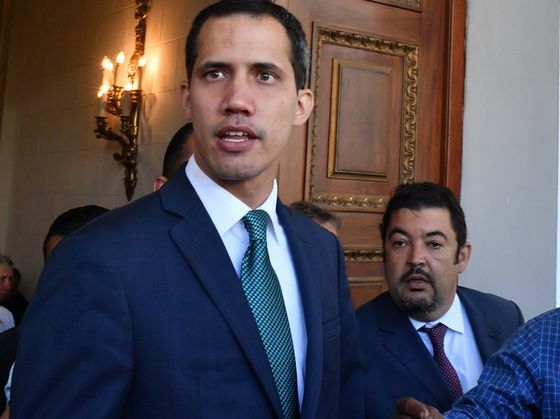 (Bloomberg) -- Venezuelan President Nicolas Maduro intensified pressure on opposition leader Juan Guaido, detaining his chief of staff under the cover of darkness Thursday morning and testing the commitment of foreign governments to protecting him. Guaido said that the intelligence police known as Sebin had raided the homes of aide Roberto Marrero and congressman Sergio Vergara, who is a member of Guaido’s Popular Will party. Appearing at an event in Caracas to hand out medical supplies, Guaido said the move underscores the regime’s weakness. Guaido, who heads the National Assembly, is recognized as Venezuela’s legitimate leader by the U.S., Brazil, and dozens of other countries, while Maduro still commands the loyalty of much of Venezuela’s government apparatus and military, as well as support from nations including Russia and Turkey. The arrest of Marrero is a challenge to the U.S.’s support for Guaido. The administration of Donald Trump, which has withdrawn its diplomats from Caracas, has placed increasingly strong sanctions on Venezuela and the regime’s officials, but has stopped short of direct action to topple Maduro. It is unclear what leverage it retains. Diego Moya-Ocampos, a political-risk consultant at IHS Markit in London, said the regime is testing the international community and its repeated warnings against laying a hand on Maduro’s rival. For more than a year, Trump has insisted that his administration is considering military force to bring about regime change in Venezuela. But the U.S. has so far only levied crippling sanctions on Venezuela’s key sectors and industries, such as oil, and lobbied its allies to break ties. On Thursday morning, National Security Adviser John Bolton reiterated that the administration has been "clear about all options on the table." U.S. Secretary of State Mike Pompeo said that the administration condemned the raid. Venezuela’s Interior Minister Nestor Reverol later confirmed the arrest of Marrero and his bodyguard on state television, accusing them of taking part in a “terrorist cell” that planned to contract foreign mercenaries to carry out attacks on government officials. Reverol said authorities found a stockpile of hard currency and weapons in the raid. The arrest comes as Guaido kicks off a national tour to bolster his protest movement, which has begun to lose steam after 10 weeks of street demonstrations and grinding hardships including hyperinflation and daily blackouts. After spending months calling on the military to break ranks, the 35-year-old congressman is now visiting major cities and backwater towns to connect with public sector workers, who are key to keeping Venezuela’s crumbling bureaucracies afloat. A lawyer by training, Marrero, 49, helped found Popular Will, known its for hard-line tactics and refusal to compromise or negotiate with the government. He previously served as counsel to Guaido’s mentor, party head Leopoldo Lopez, who was sentenced to almost 14 years in prison after launching a wave of demonstrations. He was released to house arrest in July 2017 under orders to keep quiet; intelligence police are stationed in front of his home. Sebin, whose officers cruise the roads in blacked-out vehicles, is one of Maduro’s main weapons against his opponents. The agency operates from an imposing headquarters called El Helicoide that includes a much-feared prison. On Thursday, scores of Sebin men with their faces covered entered the Caracas home of Vergara around 2 a.m., the lawmaker said in a video recorded after the incident. They demanded the whereabouts of Marrero, who lives next door. Vergara said that he told the men they were violating his congressional immunity and following unconstitutional orders, but they held him for more than two hours and eventually entered the home of Marrero. Marrero told Vergara as he was being taken away that the intelligence police were planting two rifles and a grenade in his home to accuse him of holding the weapons, according to Vergara’s account. “We’ve seen this before. This is the government’s method to try to make us back down,” Vergara said in a press conference outside El Helicoide, where Marrero is believed to be detained. Maduro’s regime has been accused of human-rights violations, including extrajudicial killings, and has held hundreds of political prisoners and detained journalists. Bachelet is awaiting a full report from a team that’s been on the ground for more than a week to review the situation in Venezuela.